We love all reasons to gather around the table with friends and family. With Easter being right around the corner and in the prime of spring, we have the food under control for you! in prime locations all over Maine! Where Are You Spending Your Dough? What's for breakfast? How about a freshly baked bagel and hot cup of joe from Mister Bagel? We're your local breakfast and lunch spot serving specialty sandwiches and some of the best bagels in town. 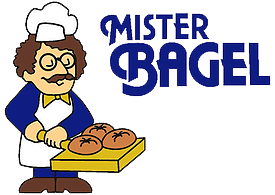 Mister Bagel is here to meet your "kneads"
All of our in-house items, both breakfast and lunch, are available for catering. Call any Mister Bagel location to book us for your event. There's nothing better than a fresh bagel and a good cup of coffee, and at Mister Bagel, we're dedicated to having the best in town. Using the finest gluten flour and fresh, never frozen dough, we knead and serve bagels that are full of flavor. What makes our bagels so good? We use a traditional boil and bake method. We believe the key to our success is Portland has great water. You won't find a better tasting bagel! We hope to see you soon at Mister Bagel for breakfast and lunch.